Margaret’s love of history began when they were six, watching documentaries about Ancient Egypt. Eventually it grew to include a love of science and learning in general. On February 27th, 2014, they joined the Houston Museum of Natural Science. This gave them the chance to share their passion and knowledge with guests. Margaret has a M.A. in History, and is always researching and studying to further their knowledge in history and science. Their belief is that learning should always be fun and engaging. Sometimes that means turning guests into mummies! (Don’t worry, Margaret changes them back…usually.) 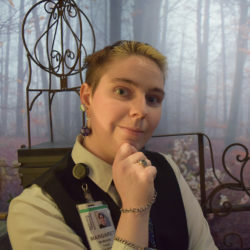 When not helping guests, giving tours, or doing research, Margaret enjoys writing, reading, exploring dungeons, fighting dragons, and having staring contests with their ball python, Wheat-and-Wheat-Byproducts.